Preheat your oven to 350F and prepare a muffin tin with 12 paper liners. In a medium bowl, combine all of the ingredients mix until smooth. At this point, you can fold in one of the optional add-ins, if desired. Cook until golden, until a tooth pick inserted in the centers comes out clean 15-20 mins. Last edited by RiverGirl; 11-04-2013 at 10:09 PM. thank you so much for the recipe It sounds soo yummy!!! We love these. I only had frozen bananas and wanted to use frozen blueberries so added 2 T flaxmeal to absorb extra liquid. They make a nice change for breakfast. If you haven't checked out Detoxinista you should. She has great recipes and most are Beach friendly or easily tweakable. I also made her her banana walnut bread cookies last night. Last edited by CyndiM; 01-15-2014 at 07:43 AM. I've never tried using apple sauce, but please post the results if you do end up using it, love to know how they turned out! I was gonna ask the same thing. I don't like bananas and typically, when a recipe calls for them, I substitute with NSA applesauce. I may try it this week. Made them today with applesauce. I used about a 1/3 of a cup. I was surprised how light they are! I skipped the cinnamon as the homemade applesauce had plenty. Also, I added some chopped walnuts and a 1/2 tsp unsweetened dark cocoa powder. I skipped the stevia/sweetener all together. I was afraid if they were a little sweet I might not be able to resist them. I will play around with the recipe a little more, but really pretty darn good! Okay, non-SBDer here. I tried my best to stay as close to the recipe as I could. The difference was using 1/2 cup of peanut butter (it was all I had on hand and I already had started the eggs and banana before I realized my mistake), added an extra mashed banana, omitted the cinnamon and mixed in 1/2 cup old fashioned oats (half was mixed in and the other half was sprinkled/swirled on top.) I also baked it in a loaf pan instead of muffins. 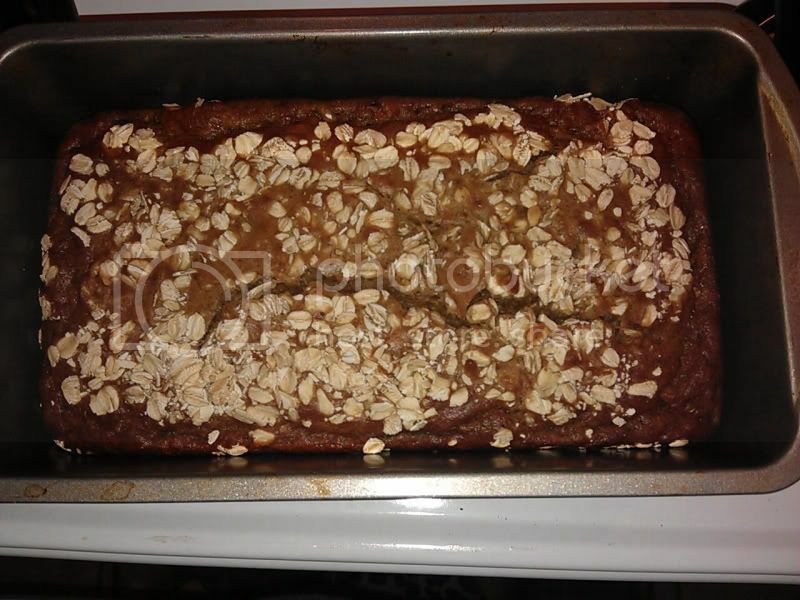 I cannot believe it looks just like a "regular" banana bread without all that flour! Very excited to try it after it cools down and I will not say a word to the BF either. He's gonna freak, lol. ETA- holy batman! They taste and look just like banana bread although with a hint of peanut butter! I'm glad I didn't have the whole cup on hand, I think that'd be way too peanutty for me. Thinking about trying this with pecan butter. Last edited by amandie; 01-27-2014 at 11:45 AM. Has anyone used Stevia? If so how much? KO I dont use Stevia, and I am not sure if you are referring to the liquid or powder form. However I did a quick Google search and came up with this site... might help answer your question.